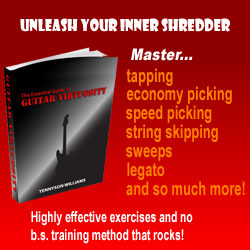 If you are like most players, you are desiring to become a better guitar player. Through my own learning experience and through teaching well over 1,000 students, I have learned a lot on this subject. Students often ask why they are not at the level that they desire to be and what can be done about it. I have asked myself this same question many times in the past. A long time passed before I began to understand the answers. A. Knows what your goals are. B. Cares about helping you reach your goals. C. Knows how to help you reach your goals. 2. Listen to more music. Find more of the same music you already like. There is a lot of music out there that you haven’t heard. I am sure you can find something you really like and that would inspire you. Look on the internet if you cant find it on the conventional radio. Check out internet radio, you can customize what you here based on your preferences, its a great tool! Check out web sites that you know feature a lot of the music in the style you like. 3. Turn your musical frustrations into an asset in the form of a motivating force. I wrote a whole article called Musical Frustration. I don’t want to repeat here everything that I wrote in that article, so read it if you haven’t already. If you have read it, it may be worth your time to read it again now. 4. Believe in yourself. You have probably heard that phrase many times before. Its unfortunate how many people still refuse to invest their own beliefs into themselves. I wrote an article on Perseverance which deals indirectly with believing in yourself. Please read it if you have a problem believing that you can reach your goals. 5. Understand that becoming a better guitarist means becoming a better musician as well. When developing your musical skills, make sure to think beyond skills that are specific to guitar. Of course you will be working on many guitar skills: various guitar techniques, chords, scales, soloing, etc., but don’t neglect other skills that are not guitar specific like, ear training (also called aural skills), songwriting, improvising, creativity, reading music, music theory, etc. from them as well. (Even if you are not better than your guitar player friends, seek out musicians that play other instruments as well anyway). Star Wars when I was a kid, reading Lord of the Rings, etc. inspired me as well. There are lots of non musical things that have been inspiring to me. The greatest source of inspiration has been my own personal experiences in life and within myself. The desire to express that was (and still is) a constant burning desire and powerful force that thrusts my desire to improve and propel me forward. Know what truly inspires you, seek it out, surround yourself with it and soak there. 8. Define your purpose. What is your definite purpose? Do you really know what it is? If I were standing in front of you right now and asked you this question, could you give me specific answers and explanations? Can you write it on paper in specific terms? This is critical to setting goals, planning strategy and monitoring the results, etc. 10. Create a strategy! You need a strategy that will layout exactly how you are going to reach your goals. Dreaming alone wont take you anywhere. Telling yourself that you are going to play your guitar everyday isn’t enough. There is a lot more that goes into being an excellent player than simply playing your guitar. Ultimately you should work backwards. State your ultimate goals (on paper) then make a bunch of short and medium range goals. Think of reaching your goals as a relay race, NOT as a marathon. Each short term and medium term goal is the end of one segment of your plan and the beginning of the next segment (just like a relay race.) There are many benefits of looking at things this way as you will discover for yourself in your own way. plan to do this. The best person to approach for this is someone who is already doing whatever it is that you want to be doing. Remember that its ok to daydream and fantasize about where you are planning to go, but it can’t stop there. Don’t wish without planning! my strategy was, because it was specific only to my goals. Chances are, your goals may differ greatly from mine in many different ways. That is why you need your own strategy for your own personal goals. One last piece of advice before we move on, write everything on paper and read it everyday! It will keep you focused and on target. 11. Imagine yourself having the skills that you desire. Focus on that and concentrate. Convince yourself that you can do it. Convince yourself that you are already on your way to reaching your first goal – because you are. Its easier to manifest your desires when you can imagine yourself already in possession of it. Keep your positive mental attitude always. 13. Find out how your favorite players reached their goals. Often times this is hard to do since you cant always sit down and talk to some very famous musicians. But interviews exist as well as a few biographies on some musicians (especially dead ones). Despite the fact that many successful artists don’t really talk much about this, you can find some that do. Believe me, becoming successful is a lot more than just practicing and luck! REMEMBER that their strategies won’t necessarily work for you because your goals may be different than theirs were. Still you can learn from it. 14. Don’t compare yourself to others. There is no need to do this anyway. Music should not be a competitive sport among people, only within yourself. Compare yourself only in relation to where you are in your strategy! Are you on your way to reaching your next short term and medium term goal towards your ultimate goals? Are you on schedule, does your strategy need to be revised? 1. Practicing is not goal orientated. 2. Not understanding the difference between playing one’s guitar and practicing one’s guitar. 16. Play with others in a band or some type of ensemble. It is important to have experience playing with others. It can be in a band or some other ensemble setting. Formal or informal. The main thing is to be doing it. (at least once a month). Some things you just can’t fully practice alone. Besides the fact that this can be really fun, it will also help you overcome stage fright if you have it. 17. Measure your progress. Document your practice time. Keep a record of how much you practice each day. For technique things, use a metronome to see how fast you are able to play a particular scale, exercise, lick, arpeggio, etc. cleanly. Write down the result, practice it all week and see if you can play it one or two beats per minute faster by next week (or next month). Keep a record of all the technical things you are currently working on. You will clearly see if you are progressing and at what rate. For other items that are not so easily recorded with a metronome, paper and pencil, record yourself on tape or your computer each week. Keep the tapes for a long time. Listen back in 1 month, 3 months, 6 months, 1 year, 2 years, 3 years, etc. Listen to how much you have grown. 18. Do not pander to your strengths while ignoring your weaknesses. It is not necessary to be able to play all styles of music or every technique to be a good player, but certain aspects are universal, such as: technique, ear training, knowledge of theory, creativity, improvising, etc. Some musical styles will rely more heavily on certain aspects than other styles, regardless, its important to be balanced. If you are a heavy metal guitarist, chances are sight reading won’t be as high on your list of priorities as technique. Likewise, a strict classical guitarist won’t have much use for improvisation (unfortunately). But make sure you don’t avoid weaknesses that you should be paying attention to because if you do – you will be sorry, sooner or later. 20. NEVER GIVE UP! Never say cant. Never say I cant. Never say someday. Never say if… If your IQ is higher than room temperature, if you have all of your fingers and if you really want to succeed, you can. It seems strange to me how many incorrect assumptions and teachings there are about becoming a better guitarist. Here are a few things that are often NOT true. 1. You should be a well rounded player and learn lots of different styles of music to become a good guitarist. This is one of the most ridiculous statements I have ever heard on the subject. Segovia (the classical guitar master) wasn’t well rounded – he didn’t waste his time to master jazz or bluegrass for example. Yngwie Malmsteen didn’t study intense jazz guitar. Most great jazz guitarists don’t study classical guitar or heavy metal guitar. Stevie Ray Vaughn never learned to play fusion or metal. Great country players usually don’t study Progressive Rock. Of course there are examples of players that do learn and play in more than one or two styles, but most of the really great guitarists are known for the style they focused on. They are masters of their style, they are specialists, not a jack-of-all-trades type of player. Don’t listen to people who say something like, You must learn blues before you can learn heavy metal or classical guitar. You do not have to be well rounded. The only time one needs to learn lots of different styles of music is because your goals REQUIRE it. If you truly love a lot of styles and want to learn them all, then go ahead and do that. If you want to be a studio musician or a jobber, then you will need that versatility. Its very hard to be REALLY good at many styles. 2. You should be able to play all the techniques of the guitar. Van Halen did tapping but not with all his fingers as others have done. He didn’t play finger style much either, but we still regard him as an important guitarist, the same thing can be said for Vai and many others. Classical guitar master John William’s probably doesn’t play well with a guitar pick (I am assuming this to be true, I have no proof of it), but he is considered one of the greatest classical guitarists alive today. Skills like improvisation, songwriting and playing with a guitar pick or not going to be high on his list of skills to acquire. This is because classical guitarists generally don’t do those things – and don’t need to in order to be great at what they do. These players are great players in their own ways and they have spent many years developing their skills. Learning everything about guitar playing would have taken away precious practice time from the things they needed to focus on to reach their goals. work well and even if it does eventually work, it will take 10 times as long! Besides, how will you know if what you are trying to do is original if you don’t learn about what has already been done? 4. To be GREAT means I have to be BETTER than everybody else. We already touched on this one above, but it is worth mentioning again here. What matters is reaching YOUR goals, not someone else’s goals. Who cares if you are or are not better than someone else? This is not the Olympics. Music is the art of expression (or for some people, the science of entertainment). better. Others can shoot a basketball better, etc. The point is athletes with great abilities have them usually in one area. For example, Michael Jordan (arguably the world’s greatest basketball player of all time) was not very successful when he tried to play baseball (or golf for that matter). Think about athletes in the Olympics, they are specialists. They have found their natural ability and developed it to its greatest potential, but that natural ability is usually limited to one skill. areas of music just like everybody else. Chopin’s natural ability was his ability to improvise. He was the master, but he worked very hard to become the virtuoso pianist that he would later become. Chopin also was the master at small forms, but struggled with large scale forms. Beethoven probably had no natural ability known to himself for a long time. He didn’t even begin composing much until around the age of 30! He was not a child prodigy like Mozart and Chopin were. Beethoven was, of course, a master, but did not enjoy the fruits of any natural talents. He constantly edited his works over and over, trying to perfect them. Mozart , by comparison, very rarely ever edited anything he wrote. Each of us has some natural ability of some kind. You may already know what yours is or you may not yet discovered it. If being a better musician is not coming easy for you that simply means you are like the rest of us.